It’s quite the unusual feature to have a rooftop garden with sweeping views across the city and the bay. It’s even more unusual when it’s a childcare centre in the heart of St Kilda! Guardian Early Learning Centre – St Kilda Road has a wealth of beautiful spaces at their centre, but the most eye-catching would have to be the rooftop space which has just recently been renovated. From the discussions and drawings, the educators created a centre display with all the ideas from the children. This provided the opportunity for some great reflections from the children and families and gave everyone at the centre the opportunity to feel a part of this exciting change. Children at the centre were involved with the planning. After a few months of renovations, the rooftop environment was complete. The gravel pit took on a life of its own. Originally intended to be a zen garden, the concrete slab didn’t set properly and children ended up being drawn to the looseness of the gravel and now enjoy exploring this space with the dinosaurs and Tonka trucks. With plenty of space and climbing structures on the rooftop, the children have been engaging in a lot of physical activity which has been fantastic for their development, social skills and health. 18 month olds in Raindrop Room and the 2.5 year olds in the Dandenong Room are practicing their balancing skills by walking and standing on the balancing beams, walking across the stepping stones and climbing up and sliding down the wooden frame. 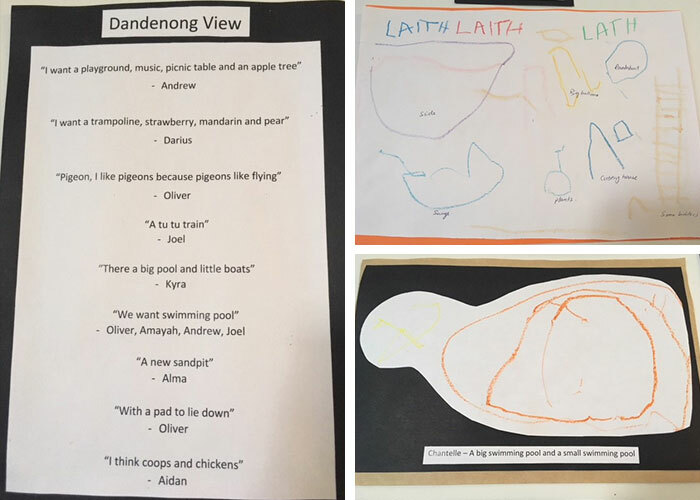 The Kinder children have been engaging in group games – turn taking, enjoying the element of surprise and testing leadership skills and participation in games such as ‘Doggy, Doggy Who Has The Bone?’, ‘What’s The Time Mister Wolf?’ and playing Hide and Seek. Just some of the great features of the new space. Still in the garden, the 2-3 year olds in the Seascape Room have also been looking after the plants and exploring sustainable practices by creating rain catchers to catch the water to water the plants with. They have also engaged in experiences that challenge their physical ability. The 2-3 year olds in Bayview have been planting beans and exploring the textures of the tanbark. They have discovered they can create marks in it by using tools and their fingers. “Our Nursery children have been using their senses to explore smelling and feeling the herbs and textured plants in the planter boxes. They have also enjoyed transporting tanbark from one space to another using the Tonka Trucks,” Aymie comments. We are looking forward to seeing how the children make the rooftop space their own and what projects come from this environment over coming months. Stay tuned! 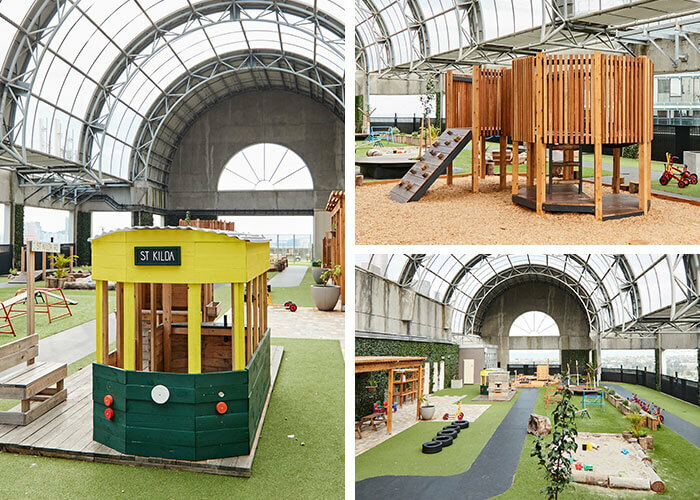 To learn more about this fantastic childcare centre in St Kilda and to book yourself in for a private tour, head here.